See Cory’s call for test knitters here. I mentioned in my previous Design Challenge post that test knitters are a really important part of getting a clear and correct pattern. Well, it’s about that time! I’m looking for a few test knitters for my as-yet-unnamed cowl. In fact, if you have any ideas for a name I’d love suggestions for that too. It’s a relatively simple project, but you will need to know how to knit, purl, increase & decrease, and pick up stitches, as well as working with two colors of yarn. As far as yarn amount goes, if you don’t mind a short cowl then 50g of each would probably be sufficient. I had 100g of each and was able to make a fairly long cowl with a bit of yarn left over. I’ll send the pattern to all test knitters by Friday 11/15, the test knit needs to be finished by Sunday 12/15. In return, you’ll get a copy of the final eBook with both my pattern and Cory’s Folded Lotus pattern. I don’t have any awesome modeled pictures of my cowl yet, but you can get a pretty good idea from the sneak peeks in the previous posts. I’ll try to update this post with a better picture soon. If you’re interested in test knitting my cowl pattern, please email me at starielknits at gmail dot com. 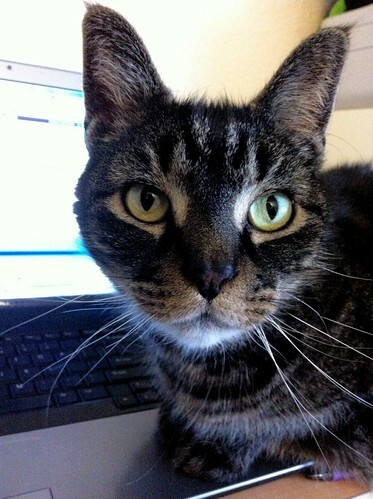 Cory’s post on pattern writing is here. I usually do quite a bit of my pattern writing before actually beginning to knit my design. I’ll write out rough instructions, and even make some quick charts in Excel before I start to knit. In this way, I’m often my first test knitter – I will follow my written instructions and add and clarify as I go along. 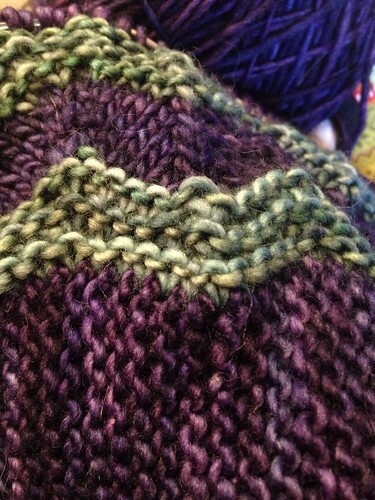 Sometimes I change things from my original vision, and I edit the pattern to reflect those changes as I knit. I do most of my pattern writing in Word, and charts in Excel. I usually work from an electronic copy, and rarely print things out unless there’s a large chart. Once I’ve knit my version and written the pattern to go along with it, I move on to test knitting. After having a pattern test-knit, I’ll go back and make changes to reflect any issues that the test knitters had – whether that’s making corrections or just clarifying instructions. I find sometimes that things that seem clear to me are not always as clear to my test knitters. This is probably because I know what the finished object is supposed to look like and how the construction works! 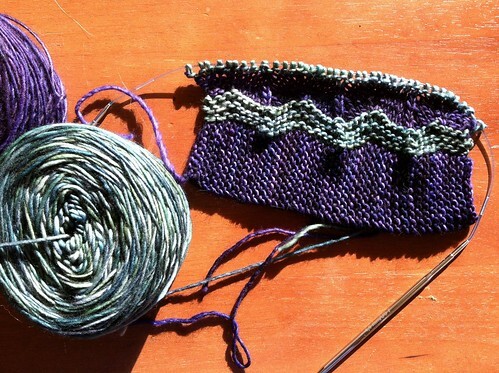 Having a pattern test knit is one of the most important parts of the design process. Then I will go back and make my charts (if any) look pretty. I still like to chart patterns in Excel, but I use a knitting font that will make standard chart symbols instead of trying to use normal letters and characters. And finally, photography and layout! Good pictures are very important, since they’ll often be the reason someone chooses to knit your pattern! I’ve been lucky enough to have a few friends with nice cameras help me out with my pattern photos. I do my layout in InDesign. My friend MJ helped me come up with a template, so I use that to put my text, charts, and photos together. It’s flexible, so I can adapt it to suit any pattern I design. After that it’s time for the release into the world at large. Exciting, but a little scary too. Check out Cory’s post on her design process here! I think my design process is much different than that of most other designers I know. First of all, I don’t have a ton of ideas just waiting in the wings until I write the pattern. Mostly I have an idea and I either write the pattern right away, or I have to figure out a way to get my idea into a knitable and wearable item and that takes a while. My Diverged socks, for example, were an idea for quite a long time before they became a reality. The other major difference is that I don’t sketch my ideas. I’m not really a drawing kind of person. And, probably because I mainly design socks, I already have an idea of the shape of the item I’m going to end up with. I also don’t usually swatch unless I’m coming up with a stitch pattern where I’m not sure how it will turn out. I did quite a bit of swatching for the Falling Up socks when I designed them because I really wanted strong vertical lines and wasn’t sure what decrease would give me the look I wanted. Also, I originally wanted to work the pattern cuff down as I do with most my socks, and I couldn’t find a way to make the stitch pattern look similar in that direction. I never did, which is why I ended up designing them as toe-up socks. Since I don’t sketch and don’t usually swatch, where do I start? Well, first I chart. Charts do for me what sketches do for most others – help me plan where certain textures or stitch patterns will end up on the finished item and what the placement will be. If the pattern is one that doesn’t need to be charted, I figure out the math and then get knitting. If it doesn’t come out the way I like, well then I’ll start over. had to be mine, because they were really pretty and had stars on them. idea for a cowl. A cowl, with really awesome star buttons. 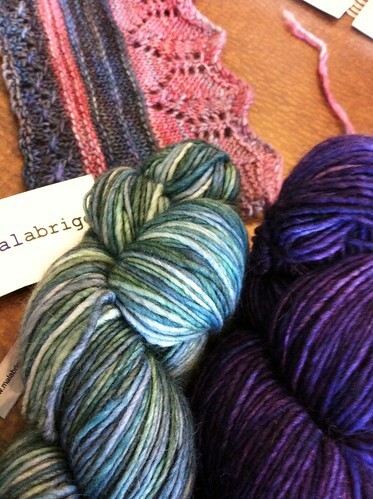 A few weeks ago, Cory came into the yarn store where I work and was looking at the Malabrigo Rastita. I told her that I really wanted to knit something with it, but I wasn’t sure what. She said that she also kept looking at it, but wasn’t sure to knit. And so… we decided to do a design challenge. We each have 2 colors of Rastita to work with, and we’re each going to design a project with it. But the exciting part is that we’re going to blog about our design process and pattern writing along the way. You can read Cory’s side of the story over at her blog, indie.knits, and of course you can read my part right here! I hope you’ll join us in our journey as we design and knit our projects. We’ll be posting for the next few weeks about our designs, and at the end we’ll each give away a kit for our design, so stay tuned!